Shopping for Star Trek Artwork? Celebrate the 30th anniversary of Star Trek: The Next Generation with this poster set! Illustrated by Dusty Abell, this set of posters includes two works of art featuring memorable heroes and villains across all seven seasons. From Picard to Yar and even Data's cat, fans will discover something memorable on each of these intricate compositions. 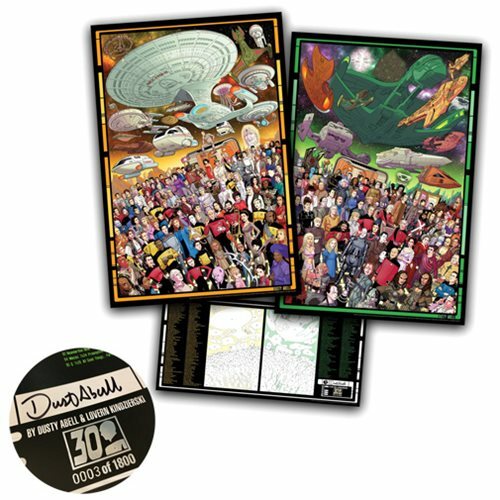 As a bonus, a third poster is included as a key to list each character, vessel, and object and comes signed by the artist with a foil-stamp of the TNG 30th anniversary logo. Each poster is limited edition to 1,800 pieces. The illustrative poster measures about 40-inches tall x 27-inches long and the key poster measures about 28-inches tall x 13-inches long.